Our concrete bins are well suitable for dry stockfood or fertiliser. They are constructed with a heavy duty reinforced concrete floor and pre-cast concrete wall sections. The bins can be covered with a tarpaulin or alternatively by a sliding metal-roofed structure. 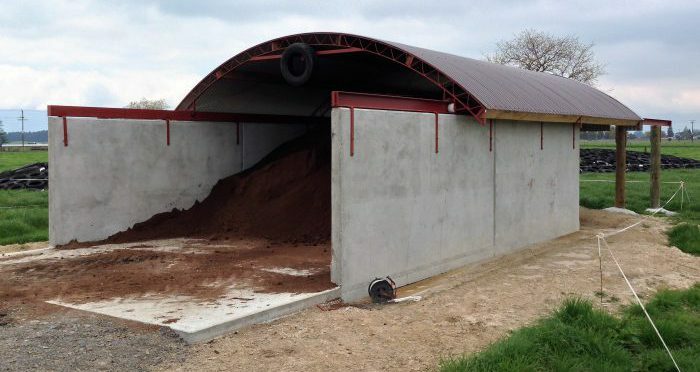 The sliding roof is pulled back to allow a tip truck to tip the feed or fertiliser into the bin, and then close it afterwards to keep weather off the contents. We can also design and build the roof to allow it to be opened with a tractor. Alternatively it can be motorised for ease of operation. If you’re after better feed and fertiliser bins, take advantage of our vast experience and contact Chapman Dairy™.